Overtime, every fire sprinkler system will inevitably leak or corrode. This is because as a fire sprinkler system ages, there are unavoidable issues that will eventually occur. However, if those minor issues aren’t caught early on, they could turn into major issues, which could then result in the need for replacement services rather than just minor repairs. That’s why it’s so important to catch the signs of a problem before it’s too late. It could save you a lot of money down the road, plus proper maintenance of your sprinkler system will ensure your building is safe and your devices are kept up-to-date and running smoothly. To help you determine if you need repair or replacement services, this blog will cover the top issues to look for and how to make a decision once you find a problem. Damage to the head or pipe could occur due to vandalism, typical wear and tear, or an accident that transpires during building renovation or construction services. If you notice issues due to tampering or vandalism, it’s best to install a protective cage around the sprinkler heads. It’s very common for corrosion to occur in any device that uses water. However, if you don’t address the issue, it could lead to deterioration that will eat a hole in the pipes, causing them to leak. The best way to identify corrosion is if there’s a rotten egg smell, signs of rust, or your water is coming out discolored. Any sight of leaking water is an issue. Leaks can easily be the result of damaged or defective equipment. They may also occur due to tight fittings, improper installations, or lack of maintenance services. If you find any signs of an issue with your system, it’s best to call a fire sprinkler system repair professional right away. They can conduct an inspection and indicate whether you’re in need of repair or replacement services. The first step to evaluating whether you need repair or replacement services is by looking at the age and type of fire sprinkler system you currently have in your building. If your system is older, it may be time for a replacement. Also look at the amount of corrosion that is currently in your pipes. If you use a dry system, that means there’s a significant amount of oxygen in the pipes. This could cause more corrosion damage, which increases the likeliness of a replacement service, rather than just a repair. If you have a wet system, there’s less oxygen in the pipes, meaning less factors that cause large-scale corrosion. This means you may only need a repair service due to a more localized corrosion. Another huge factor that affects your decision is what your repair and replacement history looks like. Building owners should always keep track of their previous repair and replacement services so that it’s easier when an issue does occur. By keeping a record of your system’s previous services, you can look at the issues overtime to determine the best solution when a problem does arise. It’s best to evaluate your budget and how frequently you need repair services. If you notice you are repairing your system on a weekly, or even monthly basis, it would probably be best to replace the system altogether. Though replacement services may sound like a costly affair, there are many ways to effectively install a new system without breaking the bank. Plus if you replace your system that needed constant repairs, you permanently resolve all the previous issues. Typically the whole system doesn’t need replaced as well. Often times only 20 percent of it needs replaced in order to fix the problem. So if you’re seeing the same issue occur over and over again, replacement might be the best option for you. Whether you’re having minor or major fire sprinkler system issues, Frontier Fire Protection is here to help. 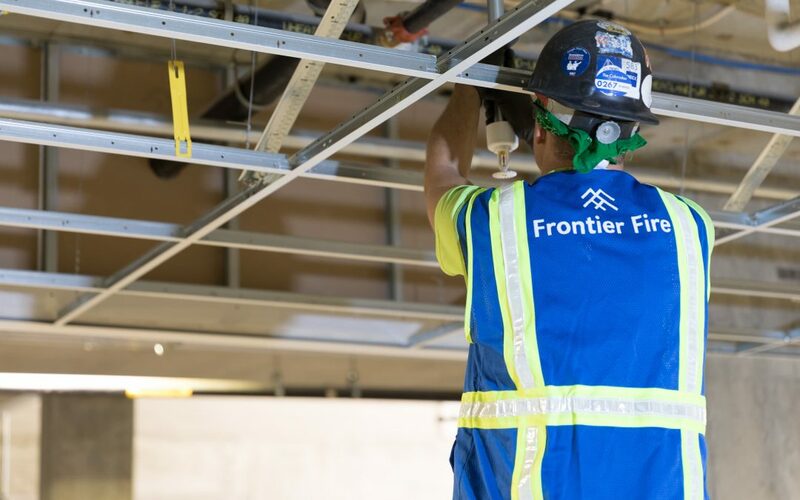 We’re the leader in fire sprinkler inspection and maintenance services for Denver and the Colorado Front Range. Our team of certified technicians would be happy to come inspect your system and find the most affordable solution for you. Plus the best way to avoid fire sprinkler system issues is by keeping up on your maintenance services. If it’s time to schedule a maintenance, repair, or replacement service, please don’t hesitate to give us a call today.